Let’s face it: When you live in the suburbs, a healthy, well-kept lawn is a must. Before anyone even steps into your house, it’s your front lawn that makes the first impression of your home. So what’s something that can help keep your lawn healthy? Many people seem to forget about aeration. Aeration, or aerification, is a method of perforating your lawn with small holes to allow for more water circulation and oxygen flow to the soil and roots. Aeration can help fix lawn challenges like poor drainage or gas exchange, soil compaction, layering in the soil profile, heavy soil in the root zone, and thatch. It’s one of the best conditional processes you can do for your lawn, and is absolutely essential in restoring a worn lawn. So how often should you aerate your yard? It depends on where you live, and the soil conditions of your yard. According to Hawley, aeration tends to be done in the spring, when the grass is coming out of winter dormancy, or in the fall, after the stress of summer and root movement. Aeration is more effective when there are higher levels of moisture in the ground, because you can pull deeper cores than with dry ground. It’s generally recommended that you water your lawn a day before aerating, and watering it again once the job is done. So how can you get your lawn aerated? More and more contractors are adding aeration to their list of services, seeing the benefits of aeration on lawns and sports fields, particularly golf courses. However, with the right equipment, it’s easy to learn the process and do the job yourself. Aerators come in different models, some similar to a lawnmower that it doesn’t take long to get a feel for the equipment. 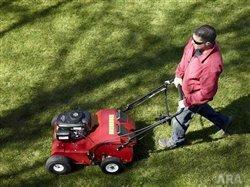 Most aerators have simple-to-use controls and can be operated by the average property owner. There’s also no need to get a license to operate the equipment, but the operator should be sure they understand how to use it so they are getting the best results for their lawn. Aerating equipment, although easy to learn to use, can be costly for the average homeowner who is only using it once a year. A basic, mechanically driven “starter” aerator still costs around $ 2,000, with higher-quality hydraulic aerators running between $ 3,000 and $ 5,000. Fortunately, aerators are available to rent from most equipment rental stores. “Because aerators are pretty easy for a homeowner to handle, it can make a lot of sense for them to do their aeration themselves, and the easiest and most cost-effective way to do that is to rent equipment when you need it,” says Anna Foster, rental product marketing manager at Toro. “In fact, a great way to save is to get a pool together with your neighbors. Everyone can chip in on renting the aerator for a day, and it can just be passed along.